I have been experimenting in the kitchen this week. 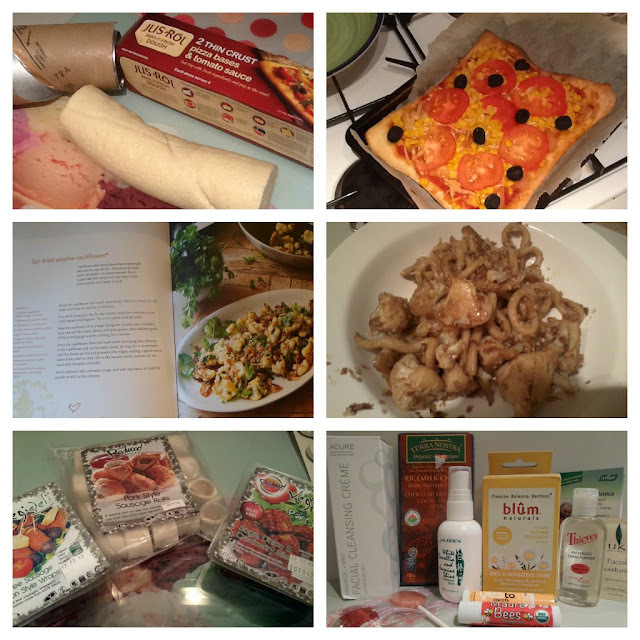 First up is pizza using a Jus-Rol ready made base which I brought at Tesco. It's a chilled product which comes with a tomato sauce and suitable for Vegans. You get two pizza bases serves 4 - 6 but being the piggies that we are we had one each. The bases are rectangular and didn't fit on our trays so we folded over. It certainly did not affect the end results. I topped mine with Redwood "ham", Sheese Mature Cheddar Style "cheese" and fresh tomato, sweetcorn and olives. Second dish of the week was Stir Fry Sesame Cauliflower from Hugh Fearnley-Whittingstall's River Cottage Veg Everyday cookbook. I did not follow the recipe exactly but what I threw together in the end was not bad just lacked colour (I left out coriander as I hate it). I added some udon noodles. I have also stocked up on Redwood seasonal Vegan treats. This Christmas I am trying out Sausage Rolls (frozen), Sausage & Bacon Style Wraps (veggie pigs in blankets) and Sage, Onion & Cranberry Bites. The latter two product are chilled but suitable for freezing so that's where they are currently hiding until the big day. Now for beauty news. I have done a swap with the lovely Caitie (naturallabeauty) who lives in Canada. My parcel arrived this week and she filled it with exciting natural goodies - Acure facial cleansing creme, blum naturals cleansing & makeup towelettes, Aubrey conditioning spray, Thieves waterless hand purifier, Yes to Carrots lip balm, Madre Bees lip balm, Yummy Earth Organic lollipops, Terra Nostra Ricemilk Choco (dark truffle centre). I LOVE the vegan pigs in blankets! Bought some last week and have eaten them in 2 different meals this week, they're super scrummy! I don't recommend the Gammon Roast though - even before becoming vegan I never ate gammon and the flavour made me sick! I didn't have that problem but my Boyfriend did, it's too much wet ingredients, he always over does the tomato sauce & that makes the base soggy.